Call +358-9-615 00 540 for a FREE consultation. Face Pillow for treatment couches. Physiotherapists often hear from patients that the edge of the face opening in a treatment couch is too hard. When patients are in therapy they have to lay on a treatment couch/table. Especially fir back massages/treatments the face needs to be in a face opening to allow the patient to breath normal. Physiotherapists often hear from patients that the edge of the face opening in a treatment couch is too hard. There is now a solution with the Polar foamgel face pillow. 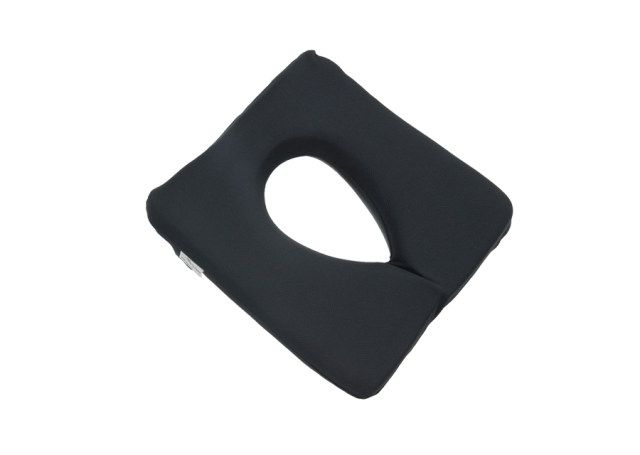 This memory foam pillow allows treatment in the prone position comfortably and protects the face. The treatment will be more comfortable for the patient. The pillow will adapt to the face of the patient and will protect it, so the edge of the face opening of the couch does no harm to the surface of the skin. The standard black microfiber cover is washable. You can also use disposable paper covers. Polar face pillow size: 27 × 30 x 4.5 cm. Material: memory foam. 2018 © Niva Medical. All rights reserved.